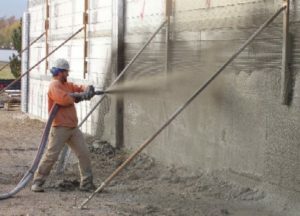 Guniting or Shotcrete: An intimate mixture of cement, sand (or fine aggregate) and water is forced or ejected through a cement-gun and shot into place by means of compressed air. The usual equipment consists of a compressor, spray nozzle and flexible hose pipe. At the end of the hose there is a nozzle to which water under pressure, by a separate connection, is added to form a slurry. Uniformly graded, thoroughly mixed dry materials, with low water/cement ratio, are charged into the gun and shot under pressure by compressed air. Slightly moist sand works better. The usual proportions of cement and fine aggregate are 1:3 or 1:4. The fine aggregate should be well graded up to a maximum size of 10 mm usual size is 4.75 mm downwards. Hard-stones sand should be used. Just only sufficient water necessary for the hydration of cement is used. There is usually 20 to 30 per cent “rebound” depending upon the wetness of the mixture. A very wet mixture will not stick. While shooting, a nozzle under normal conditions is held at a distance of about 75 to 90 cm from the working face. The surface to be treated must be thoroughly cleaned of any dirt, grease or loose particles and should be fully wetted. The correct No. of gun should be obtained for the maximum size of aggregate or sand to be used. Reinforcement, usually of 80 mm sq. mesh, may be incorporated to withstand structural or temperature stress. This method is very useful for rehabilitating or reconditioning old concrete, brick or masonry works which have, deteriorated either due to climatic condition or inferior work. It is also used for water-proofing exposed concrete surface or for resisting water pressure on pipes, cisterns, etc., where it forms a very impervious layer. The bond between old bad concrete with corroded reinforcement and guniting or shotcrete is not assured very effective always, it is sometimes advisable to replace total concrete. Grouting or pressure grouting has to penetrate to some extent into the porous concrete surface exposed. Effectiveness of their surface is considered to last for about five years only. For bad concrete and corroded reinforcement, clean all the exposed concrete surface with water (in addition to the reinforcement as explained above). Various chemicals with different trade names are now available in the market which can be applied on the old concrete surface for bonding of the old and the guniting or shotcrete. If surface to be concreted is more than 25 mm, expanded metal or wire-mesh can be used. Permeability of concrete is reduced to a greater extent. Repairing of concrete can be done in a short period of time.